It was a dream Sean Murphy had fostered since high school, ever since he’d first dipped an ear into the Dirty Dozen Brass Band’s discography. Murphy had a vision of a brass-band outfit anchored by a tuba bass line—a combo that could draw from New Orleans traditions, but one that mainly honored the deep, wide-ranging musical history of Memphis, Tennessee. And it took a couple of decades of woodshedding in a wide array of formal and improvisatory settings, but today, tuba player/composer Murphy and a group of crack-shot co-conspirators are brewing a strong, soulful pot under the moniker Mighty Souls Brass Band, comprising some of the city’s most sought-after musicians, putting a uniquely Memphis spin on a tradition that’s as global in its scope as it is root-deep in American popular music. True enough. Check MSBB’s roster, for one thing—an evolving list of knockout players whose chops around Memphis are long-established. 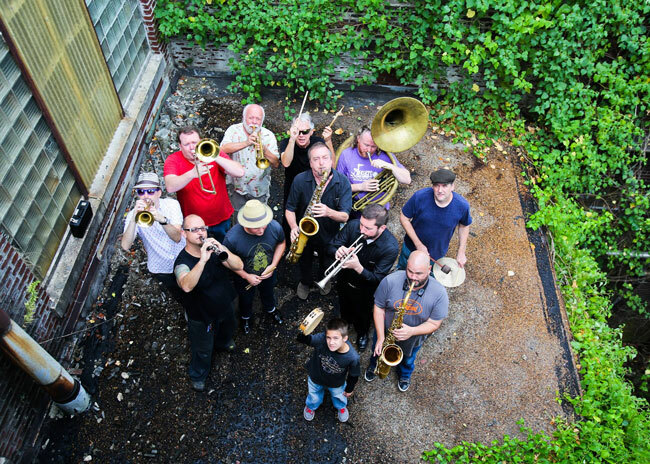 The group began to coalesce in 2012, when Murphy and Jim Spake came together to play a New Orleans-style funeral, accompanied by horn player/vocalist Jeremy Shrader and percussionist Earl Lowe. Murphy, who has spent 13 years honing his chops in an improv dance and music group, found a kindred spirit in the wildly versatile Spake, whose sax playing appears on three decades’ worth of albums by Alex Chilton, Al Green, the North Mississippi All-Stars, Natalie Merchant, and dozens more. When Murphy outlined his project—a brass ensemble whose repertoire drew from American soul and funk as well as global traditions—Spake jumped at the chance, as did a host of other players from Memphis’ powerhouse session-musician community. On any given night the talent represented onstage at a MSBB show can run from five to fourteen members deep, showcasing some of the best and most esteemed players in the city’s rich performance pool. That elasticity—of personnel, and of the music—allows MSBB to enjoy a lot of flexibility in its arrangements and live performances. That portability brings us to MSBB’s many diverse gigs, which can take them—as the band’s lively booking schedule recently did, over the course of a single day in October 2014—from a morning show playing globally-derived “world brass band” music for children age eight and younger, to an afternoon’s polka-inflected set at an Oktoberfest party, to an evening opening for (and backing) New Orleans legend Dr. John. To hear Murphy talk about the heady blend of styles the MSBB works in is to hear how the band’s music drinks deep from a multitude of sources. The tight, polished work of MoTown’s session horns; the gritty, dirty inflections of New Orleans’ funky Meters; the slippery R&B of Memphis’ own Booker T. & The MGs—it all finds a place in the thumping heartbeat of Mighty Souls Brass Band.